When most of us think of Michoacan, we think about life at an altitude of 7,200 feet around Lake Patzcuaro, or a little lower in Morelia. Volcanoes can reach nearly 2 miles above sea level, with freshwater lakes neatly tucked between them. We think of the colonial highlands, with the mountain craft-villages of Ocumicho and Paracho. We think of crystal clear, mountain air in Erongaricuaro and pristine lakes like Zirahuen and Los Azufres. 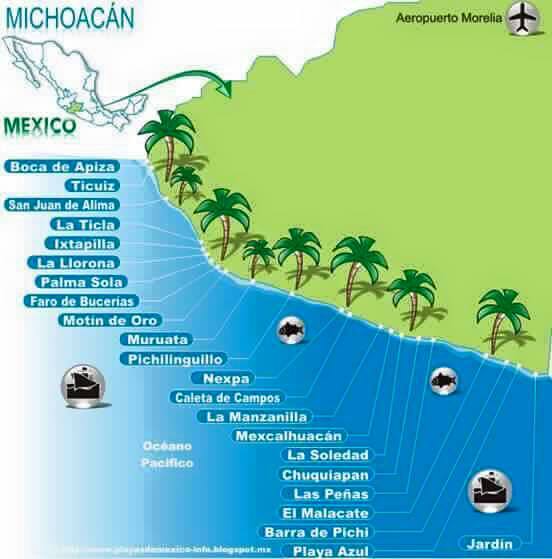 We do not visualize Michoacan at sea level, nor on the oceano Pacifico, but we should. The cool, winter months are the best time to make a splash on the Michoacan beaches. Take the Lazaro Cardenas cuota south about 200 miles (about 3 hours) to the beaches of Michoacan. 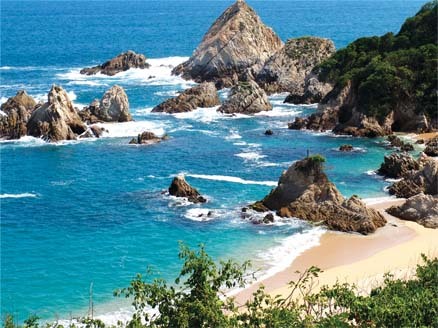 The coastline of Michoacan is 155 miles of the most beautiful beaches in Mexico. Dozens of the Michoacan beaches are untouched, with vast, amber-colored coastlines. 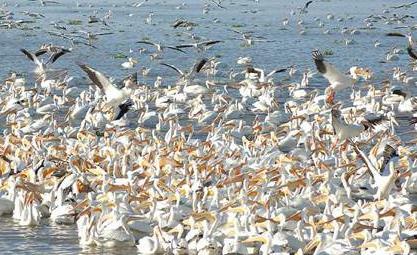 A handful of beaches are hidden by bird estuaries, with some between cliffs and coves. 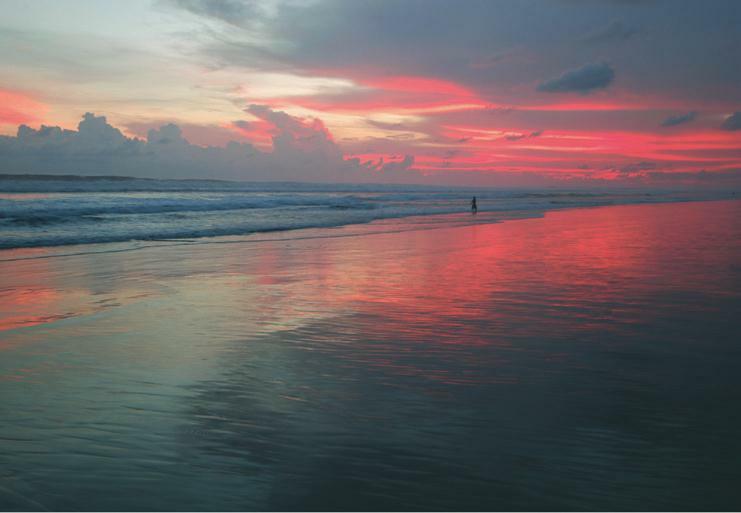 Other beaches are at the mouths of calming rivers, suitable for swimming and sunbathing. Other beaches require a surfboard. A few beaches require an appetite, to eat the delicious sea food being served. One beach offers death, at Playa de los Muertos. Highway 200 follows the coastline for easy driving. Buses will drop-off or pick-up passengers anywhere. There are beaches to spend an hour or stay the day, with plenty of places to eat. The southern most Michoacan beach is Playa Azul, outside Lazaro Cardenas, and the beginning of some of the most unspoiled beaches in Mexico. When you go to Playa Azul, don't miss the boat trip on Laguna Pichi, a freshwater Lake about a mile and a half, east of town. The Lake is surrounded by a mangrove forest with Palm trees, and plenty of seafood enramadas. The three beaches of Playa Maruata each offer something different and are considered the most beautiful beaches in Michoacan. This place is rustic, with camping, palapas and cabanas, but no hotels. Centro Ecoturistico Maruata has very nice cabanas over-looking the beach. Please understand we are not talking about Ixtapa, Cancun or other resorts. We are talking about the beaches of Michoacan, our closest beaches, which are primitive, rustic, secluded, unspoiled, golden, deserted and delicious, for those of us who eat. 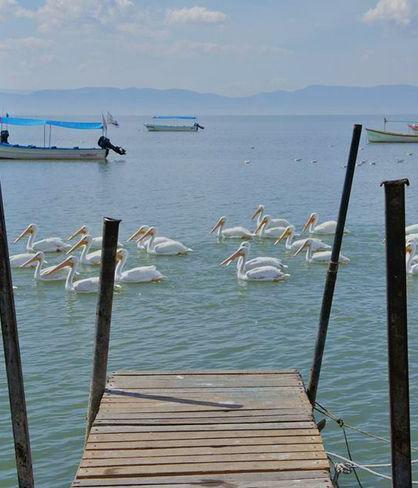 The annual Festival of the Pelicans (Festival del Pelícano Borregón) is in Cojumatlán, down the coast a few km from Petatán, on the Michoacan side of Lake Chapala. 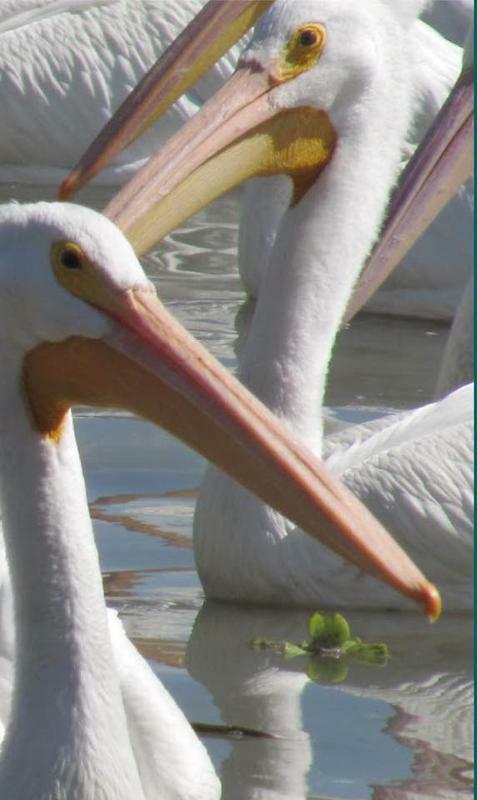 The pelicans feed around 4pm at Petatán/Cojumatlán through early April.